The first event in the National J24 calendar saw teams travelling to the Royal Dart YC for the Spring Cup over the weekend of 16th /17th April. Dartmouth in the spring decided to provide the complete range of weather from beautiful sunshine to hail. A cold northerly breeze that swung easterly on the Saturday, just before the first start, helped remind the competitors that they had forgotten to wear sufficient warm clothing. 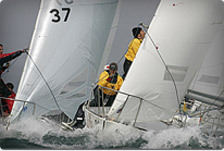 With the wind building to top end of the genoa range, crews were kept busy trying to understand the tide, anticipate the shifts, and keep up with Roger Morris (Jolly Roger) who scored an impressive five points from four races on day one to lead by three points from David Cooper (Jawbreaker) . The clear blue skies at the end of the days racing provided excellent evening sunshine to enjoy one of the most impressive views from a sailing club, anywhere in the UK. The Royal Dart YC is 150 years old in 2016 and is well practiced in providing warm hospitality for thirsty racing crews. The clear sky and sunshine on Sunday morning resulted in a wind struggling to get over eight knots and definitely undecided as to its direction. A race officers nightmare, and for some sailors, a game of snakes and ladders in the fickle and shifting breeze. Discarding a third and finishing with eight points, Roger Morris was able to maintain his lead from Dave Copper in second and Nick McDonald (Cacoon) in third. 2016 is a big year for the UK J24 Class with the European Championships being held in Plymouth in August. Many of the teams at Dartmouth were carrying Sponsors logos and making sure their support is visible outside of their home port. European entries are coming in fast and teams are asked to register early to avoid disappointment. 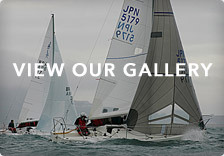 A link to the Yachts and Yachting website with the report.